Mustard is one of the world’s most popular condiments, and it adds delicious flavor to our food. However, there are so many varieties of mustard that knowing the differences can be confusing. This article provides a complete guide to prepared mustard; what it is, its nutritional properties, and the different types available. Additionally, we’ll look at how to make homemade yellow mustard, which is much easier than most people assume. Prepared mustard is merely the spreadable condiment that we can buy in any store; it has been prepared already, and it is ready to use and eat. 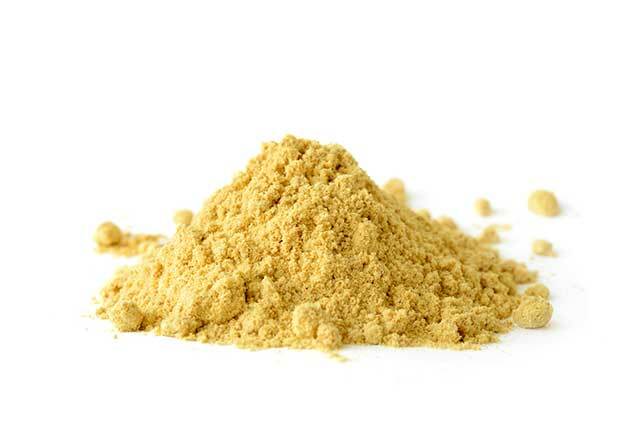 The opposite of prepared mustard is dry mustard, which is otherwise known as “ground” mustard. This form of the condiment is still in its pure, unprepared state, and requires further preparation to make it into a spreadable form. Yellow mustard is one kind of prepared mustard, but it is not the only one, and there are many different types. Key Point: Prepared mustard refers to ready-to-use mustard in a spreadable form. What Is Prepared Mustard Made From? Almost everyone knows that ketchup comes from tomatoes and mayo comes from eggs and oil, but where does mustard come from? While they are not quite as famous as the source ingredients for other condiments, mustard seeds are the main ingredient in mustard. However, how producers use the seeds depends on the variety of mustard they are making. For example; whole grain mustard (as you saw in the above image) contains the seeds in their whole state. On the other hand, the seeds need toasting and grinding into a fine powder to make yellow mustard. First of all, there are so many products out there, so there is no one single ingredients profile. There may be an additional spice or two such as paprika, but good quality mustard will generally have an ingredients profile like the above. Watch out for brands that add sugar and vegetable oil; there is no need for these ingredients in traditional mustard, and they detract from the taste and health properties. 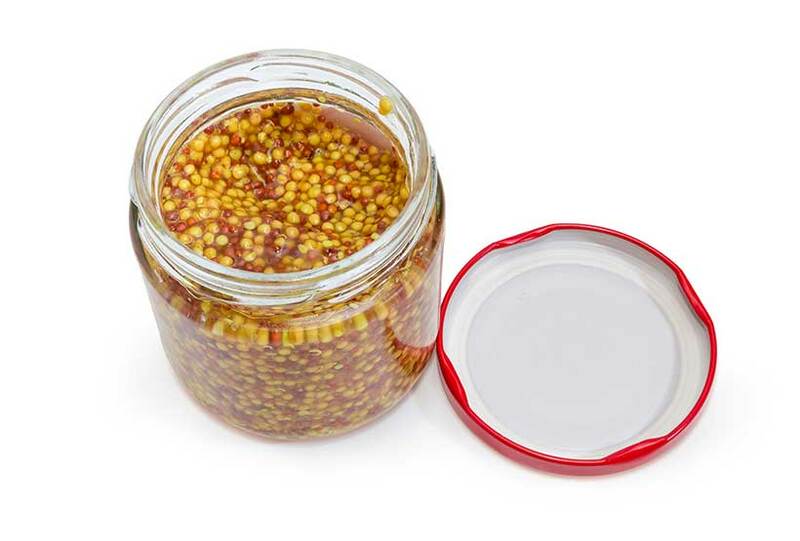 Key Point: The main ingredients in prepared mustard are mustard seeds, vinegar, salt, and water. As mentioned earlier, we can also buy mustard in its “dry” ground form. Dry mustard is a coarse powder that works well as a flavoring spice. However, you will be disappointed if you try to use it in the same way as prepared mustard (don’t try). Compared to prepared mustard, this ground variety has a stronger and more powerful spicy taste. However, it lacks the tangy/acidic taste since it doesn’t contain vinegar as the spreadable form does. If you are cooking and a recipe calls for dry mustard, then it is possible to use prepared mustard as a replacement. There will be a slight difference in flavor due to the additional ingredients, but it will still taste good. For this purpose, if a recipe requires one teaspoon of dry mustard, then an equivalent amount would be one tablespoon of prepared mustard. The reason for the difference in quantity is because dry mustard is 100% pure, which results in a much more powerful flavor. It is also possible to use this one tsp to one tbsp ratio at increasing amounts. For instance, two tablespoons of prepared mustard are equivalent to two teaspoons of the dry spice, and so on. Key Point: Prepared and dried mustard offer different flavors, but they are fairly similar. One teaspoon of ground mustard is equivalent to one tablespoon of the prepared variety. Generally speaking, we use mustard in small quantities, so it does not contribute a significant amount of nutrients to our diet. However, for those who are curious, here is the nutrition profile of a standard jar of prepared mustard (1). As shown in the table, mustard contains a relatively equal amount of all three macronutrients. Additionally, it is a reasonably good source of ALA omega-3 fatty acids. Aside from vitamin B1, prepared mustard is not a significant source of vitamins. Prepared mustard contains a high amount of manganese, selenium, and sodium. However, it is worth remembering that mustard is not a particularly good provider of nutrients since we eat it in small amounts. Key Point: Mustard has a fairly good nutrient profile, and notable nutrients include selenium and omega-3. While there are hundreds of unique varieties containing slightly different ingredients, here are some common types of prepared mustard. American yellow mustard is quite weak in flavor and often contains syrup, hence it offers a mild and smooth taste. Since it only uses yellow mustard seeds (in addition to turmeric for coloring,) this spread has a bright yellow color. Dijon mustard is a traditional French mustard named after its place of origin. It is similar to American yellow mustard, but it has a stronger flavor and more of a spicy kick. Dijon often comes in whole grain form, which includes the whole seeds in the spread. English mustard is the same as American mustard in most areas except one: the spice level. The mild taste of the American version is gone and replaced by a hot-tasting experience. Interestingly, French mustard is not actually French, and it is a product of the UK. It is somewhat similar to American yellow mustard, and it was originally created as a milder substitute for the spicy original English variety. Honey mustard is a sweet and mild version of the condiment, and it is often used in salad dressings and sandwiches. Generally, the products we can find in-store contain a 1:1 ratio of mustard and honey. For cheaper brands, it is likely that the mustard uses corn syrup rather than honey. This spicy spread is a simple mixture of dry mustard and water, but it may sometimes contain other ingredients such as vegetable oil or cayenne pepper. This one is the hottest-tasting mustard you are likely to find. Hailing from Germany, the ingredients profile is generally similar to English and French mustards. However, there is one big difference; this condiment contains more sugar than it does mustard, hence the sweet taste. In addition to the varieties listed above, there are all kinds of interesting mustard options. Key Point: There is a wide range of mustard choices. English is the hottest of the traditional options, while American and French varieties offer a milder or sweeter taste. Since a typical serving ranges from five to 15 grams, any potential health benefits or drawbacks from mustard intake will be small. However, here is a quick run-down of the pros and cons of using prepared mustard. Key Point: Prepared mustard is cheap, convenient, and even provides a few beneficial nutrients. For those that like making their own recipes, it is easy to make your own “prepared” yellow mustard at home. The following three recipes require less than 10 minutes of total prep time. To make this, just combine the ingredients and mix well until you have a smooth, consistent paste. After this, put it in a jar and leave it for a few days to thicken and mellow. First of all, chop half of a medium-sized onion into small, fine pieces and then saute them. Once the sauteed onion cools, combine all ingredients, mix well, and then transfer to a glass jar. For this spicy mustard variety, combine the water, powder, vinegar, chopped onion and salt. Add the mustard seeds last. Next, mix everything well and transfer to a glass jar. Key Point: Preparing a homemade mustard is easy and takes no time at all. Prepared mustard is a tasty (and relatively healthy) condiment that can add an extra dimension to food. It is available in all different varieties, and it only takes about 10 minutes to make some at home.